← Robin Hood’s birthday, really?!? – Really! Finally, I’m putting together my list of 25 All Time Favorite Films. I’ve always been a huge movie fan and tried several times to put together a top 25 list. Last year I blogged about my Top 10. Problem is, I love movies, all kinds of movies. And there are 100’s and 100’s of films that I really, really like. So the question has always been, how do I narrow down my many favorites to a top 25? Actually I’m a little sad as I’m putting together this list. The reason being that in recent years there haven’t been a whole lot of really wonderful movies that would make my Top 25 list. I like all kinds of movies. My top 10 covers several genres. Most overlap and include: comedy, drama, action, adventure, thriller, romance, sci-fi, animation, fantasy, war, and there’s even a musical! Take for instance one category, I’m a big fan of Action/Adventure films. The new blockbuster Jurassic World is a terrific movie. But it lacks the “heart” of the original Jurassic Park. The 1993 Steven Spielberg directed movie, based on Michael Crichton’s excellent book, is a near perfect film. Along with the action, 1993’s Jurassic Park brings together story, characters, visuals, soundtrack, and an emotional core where you really care about the characters. 1981’s Raider’s of the Lost Ark, another Steven Spielberg film also pulls everything together making a truly great Action/Adventure movie. These are just two films on my Top 10 list with characters that are heroic or simply step up when confronted with the challenges they meet. As I mentioned I like all kinds of movies. But I most enjoy movies, as I think we all do, with characters with whom I can relate. I enjoy movies with “heart,” whether comedy or drama. Reviewing all the movies that I’ve seen which have come out over the last 10 years, there really aren’t many that contend for a spot on my Top 25 list. Sure, there have been many wonderful films, exciting, fun, even great films that have come out over the last 10 years. But only a few really contend for a spot on the list. The Adventures of Robin Hood (1938) – In my last post I mentioned how much I loved this film from the first time I saw it as a kid on Saturday afternoon TV. It’s as good as ever. Die Hard (1988) – As is most often the case, the first in a series is the movie I like the most. Bruce Willis, perfect as off-duty detective John McClane and as Hans Gruber, Alan Rickman is one of my favorite bad guys. Groundhog Day (1993) – I’ve always loved movies where there’s movement toward redemption. Combine that with a movie that’s laugh out loud funny, clever, and at times a little bizarre – It’s pure comedy at it’s best. 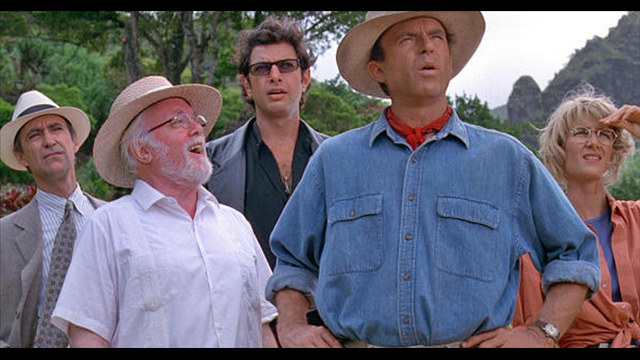 Jurassic Park (1993) – I said it above, Spielberg here made a near perfect film – He’s one of my favorite directors. Now, to fill out the rest of the list is my challenge! Frank Zappa said “So many books, so little time.” Yes I love my books, but as I’ve blogged before I wasn’t always a reader and my love of reading came slowly over a long period of time. But I have always loved films! Movies are the story telling medium of Popular Culture. I believe as boys and men in general, we learn and process thoughts and feelings about ourselves with the help of the storytelling medium of popular (and sometimes not so popular) film. In my next post I’ll sort through the dozens, if not 100’s of films to fill out the rest of my Top 25. This entry was posted in Inspiration, Movies and tagged Jurassic Park, Pop Culture, self-discovery, Steven Spielberg, Story Telling. Bookmark the permalink. Yes Jerry, I enjoy my Big Summer Popcorn movies but I also try to keep an eye out for smaller films that are able to pull it all together. A few that I really enjoyed in the theater or on DVD in the past year or so are: Snow Cake (a few years old), Chef, Philomena, and The Way, Way Back. We share many favorite films. Having a similar world view, and appreciation of story, from what I’ve read on your blog, I’m not surprised we share many favorites. – – Something that surprised me, I saw an AFI special on director Rob Reiner where he shares that, like me, his favorite film is It’s A Wonderful Life. . . who’d a thunk !? !